Gloria Nicol of The Laundry will, along with myself, teach a workshop on pressure canning and hot water bath canning at The Secret Garden Club on March 3rd. Afterwards we will have a ‘jar’ meal. I’ve been trying to promote canning and the canvolution, as they call it in America, for a few years now. Aside from the difficulty of buying a pressure canner in this country, it’s still not well known in the UK. Learning how to can or bottle produce has totally changed my approach to how I source ingredients, store food and cook it. Making use of mainly homegrown or locally grown produce means naturally following the seasons and going with the flow. I feel it allows me to appreciate more living in the moment. I just love that. Bottling fruit was once a common activity in the UK, especially during wartimes until freezing food became the easier option. Once every household had a freezer, bottling was seen as to much of a faff, all but one of the companies in the UK making the necessary equipment died a death and only a handful of diehard allotmenteers and make do and menders managed to keep the craft alive. I too own a freezer and it is filled to busting with stuff I generally forget about. I have realised that if I freeze some homegrown veg, all the while it languishes in the freezer it is clocking up additional cost. It is an expense most of us are quite prepared to accept, but with utility bills rapidly on the rise, these considerations become more relevant. Those bargain beans will have cost a fair bit more by the time I use them, that’s if I remember to use them at all of course. Alternatively, the joy of jars on shelves means once bottled the food doesn’t cost a penny more or require defrosting either. Pop open the jar and it’s ready to go. It is surely time to revive this culinary craft and give a big tick for sustainability. But apart from all the practical reasons to love canning, the flavours are the biggest plus. I was brought up to think that preserved foods were second rate and nowhere near as tasty as fresh. What I have experienced first hand confounds these ideas. By following correct practice and keeping cooking times safe but to a minimum, you can capture the most intense and delicious flavours in a jar, capture the absolute essence of those ingredients. Read the rest of her blog post including recipes here. 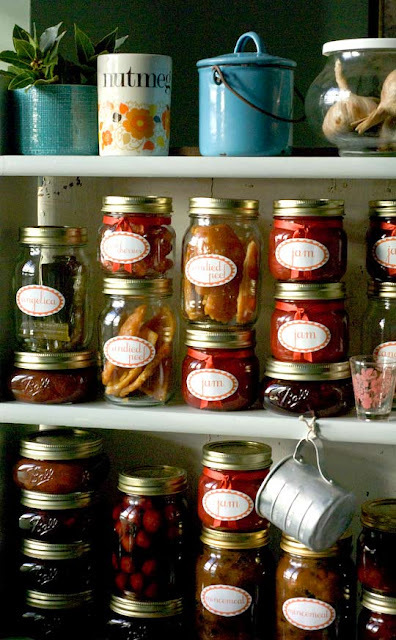 Canning is environmentally friendly and tasty. 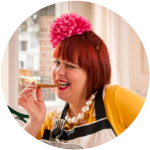 Plus you can start on putting together a beautiful larder full of beautifully diverse ingredients. Price of the event is £60 per person which includes the lesson, the meal and a goodie bag with a jar from Le Parfait. This is a one off event so don’t miss this chance to see myself and Gloria at work. Book here: http://www.wegottickets.com/supperclubs/event/197287 Places are limited. March 3rd 2pm. Love this. My family didn't have a freezer but we grew most of our own veg. Redcurrants and blackcurrants would be bottled and my Mum made the most gorgeous tarts with them in the depths of winter (we always had pudding) with custard. She also bought bruised peaches from the greengrocer which were sold off cheap, the bruising cut off, fruit skinned and bottled. I sound like I'm from the Victorian age now but although only a few decades ago this now seems light years away. Bravo for championing this and holding such a great course. I come from a long line of home canners. The sight of a well stocked pantry fills my heart with glee. I wish I could attend this event but since I can't, I just want to say thanks for keeping the art of home preservation alive! Does canned (bottled) food need to be kept in a light or dark place? I'm thinking of the implications of replacing our freezer, which currently lives in the (dark) garage. Sally: they are pretty aren't they? I have a sort of larder going but I want more larder shelves. Mark: I'm not sure. I'll find out. 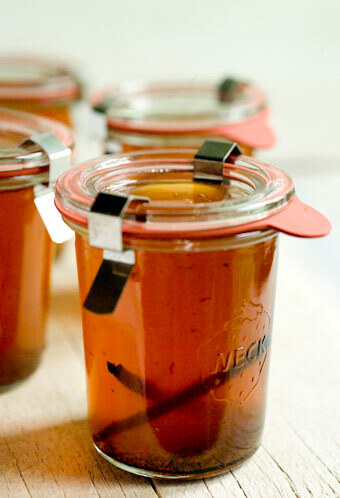 In answer to Mark – the best situation for storing your jars is in a dark coolish place. Light will alter the appearance of your bottled food faster over time. If you haven't got the space you have to do what you can!